Delos Lone Wolf, a member of the Kiowa Nation, is estimated to have been born in 1868. It appears that he is related to a well known Chieftain named Lone Wolf. He came to the Carlisle Indian School on July 4, 1892 and graduated on March 4, 1896. Both of his parents were listed as living. It seems that he was highly esteemed by the school administrators because they characterized him as “very good” according to his student file. He was very involved during his time at the Carlisle Indian School. He held many leadership positions such as Treasure of the Standards Committee and the Committee on Arrangements which were indicated in monthly publications of The Indian Helper in 1893. After he left the school, he married a fellow tribe member named Ida Wansey (alternative spelling Wasee) who was eight years younger and also attended the school. The 1899 US Indian Census Rolls indicates that they had a daughter, Hazel Lone Wolf, in 1899. His occupation after graduation was farming which is indicated in his file. 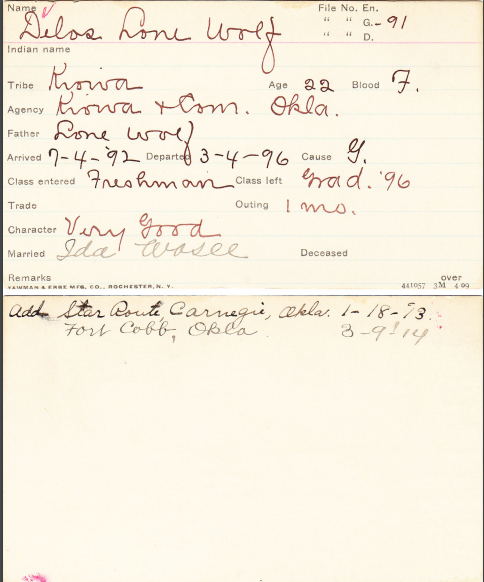 On May 31, 1910 Delos Lone Wolf returned to the school and filled out a survey that was recorded by Mark Penor. This survey was of great interest because in it the administrators seemed to drastically changed their high opinion of him. Penor (administrator) described Delos Lone Wolf as “not up with the times”, because he wanted to return to his tribe and become chief in order to lead his people “in the old tribal ways”. The survey even specifically emphasized that his ambitions were “a thing of the past” as can be seen below. They criticized his occupation because apparently he does not “stick” with any type of special work. 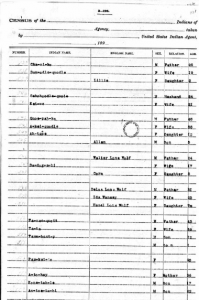 The family were farmers in Fort Cobb, Oklahoma at least until 1914 according to his Student Information Card. Farming was a common occupation for many Native Americans during his time. This entry was posted in Delos Lone Wolf, The Conflicted and tagged Farming, Hazel Lone Wolf, Ida Wansey, Oklahoma, Survey, Tribal Way, US Indian Census. Bookmark the permalink.